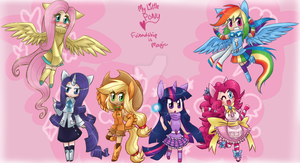 My Little Pony Friendship Is Magic Chibi Chain is finished!!! Took 2-3 days XDD I am so excited about it! This has got to be one of my absolute favorite Chibi Chains. I had room to design the ponies as humans and it was soooo fun!!! I looooove Fluttershy's hair in this pic!!! whoooa, this is so amazing. If posible, make a chibi chain of my characters. Aww these are adorable !